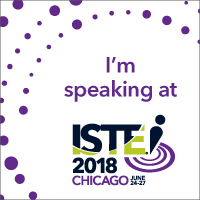 It is officially ISTE 2018, and that means I get to start learning from some amazing educators! My first session of the conference is Top Tech Tools for Teachers presented by Dan Kreiness. Let me start with that ISTE does not have its organization on point this morning. These are the People’s Choice sessions, which were voted for by hundreds of people, so it is logical to assume that many people would attend. But, they put them in small rooms, and there are probably 600 people in line outside who didn’t make it in. Which is sad for them, but awesome for Dan that his session is so full! Now, onto the session. Dan set his session up as a set of 4 categories of tools. Each category he quickly explains a few tools that work for it, then gives everyone time to look through the tools and play with them while he walks around and answers questions. It’s very interactive and means that Dan isn’t just talking at everyone the whole time. I like it. Here is a direct link to the Padlet that Dan made to organize all the tools. 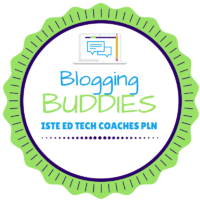 The four categories are Calendar and Scheduler, Organize and Curate Ideas and Resources, Reflecting and Record Keeping, and Collaboration, Networking, PD, and Social Media. I won’t go through all of them, but I’ll talk about some of my favorites. First, Google Calendar. As an Instructional Coach, it is really important to be available for your staff. One way to accomplish this is by creating a calendar of appointments that your staff can sign up for. I do this a lot, with appointment slots set up within our class period schedule. Then, I provide a link to my staff, where they can click on the period they want me to meet with them and then I go to them. It’s very powerful. He also talked about Flipgrid, which got a lot of people talking. 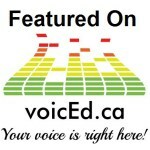 It is a very powerful tool, and to use it to organize resources for staff is a great idea. You could make title cards for each topic of resources, and attach short videos describing, and then a link to another resource. Plus, with it now being free for everyone, that really opens up options. One of the last tools he talked about was Voxer, and he even included me in the session, which was fun. He sent me a Vox live during the session, and I replied to him during the session. Talk about interactive!